Don’t be afraid to speak up in class. There’s a good chance that at least one other person doesn’t get it, either. Use your prof’s office hours or schedule an appointment. Make a list of your questions and bring it with you. Record the answers on your list! Put the information into your own words. This helps you retain it. Create flashcards. Use the Quizlet app on your phone to create flashcards and quizzes. It will help you look at topics from different perspectives and you might even discover more effective study tips. Form a study schedule, and stick to it. If your friend invites you on a Meijer run, remember to trade an equivalent amount of break time elsewhere in your schedule for study time. You’ll be more productive if you include brief (10-15 minutes) study breaks every 1-2 hours. Do something entirely different during that time (e.g. going for a walk, run, or meeting a friend for a quick snack). The absolute worst place to study is on your bed. Even if you are at your desk, you can’t help but see your bed and be drawn in, or have a neighbor distract you. Instead, take your headphones and study materials to the library or nearby café with free Wi-Fi and good coffee. Don’t wait until the night before your exam to pack your brain with dates, statistics, and formulas. Pulling all-nighters can actually strain your brain. Need help/encouragement? Stop by the Academic Success Center in VanZoeren 261 for your personalized study session and a free deck of ASC Final Exam Study Strategies cards. ASC Workshop to Prep for Finals- yes they are coming! 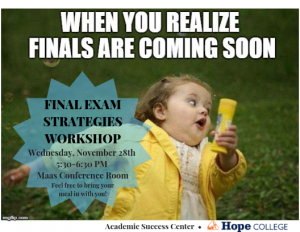 Format ImagePosted on November 26, 2018 Author Suzette StaalCategories ASC, Other, Study strategies, TutoringLeave a comment on ASC Workshop to Prep for Finals- yes they are coming! Persevere. College can present challenges but facing them will prepare you for challenges in your future career and life. Posted on November 19, 2018 December 5, 2018 Author Suzette StaalCategories ASC, Study strategies, TutoringLeave a comment on ASC Study Tip- Persevere! One Week Left to get an ASC Tutor! The last date that the ASC will accept applications for a tutor is Monday, November 19. If you would like to be matched with a tutor (for most 100 & 200 level courses) please stop by the ASC (261 VanZoeren Hall) by 5:00pm Monday, November 19. A printable application and further information can be found on the ASC website. Posted on November 12, 2018 December 5, 2018 Author Suzette StaalCategories ASC, Other, Study strategies, TutoringLeave a comment on One Week Left to get an ASC Tutor!